Newton Has Talent: Apply by Midnight Tonight! It’s not too late to submit your act to Newton Has Talent! We’ve extended the submission deadline to Friday, February 27 at midnight. Calling all singers, dancers, musicians and other performers. If you have the chops, we have the contest. 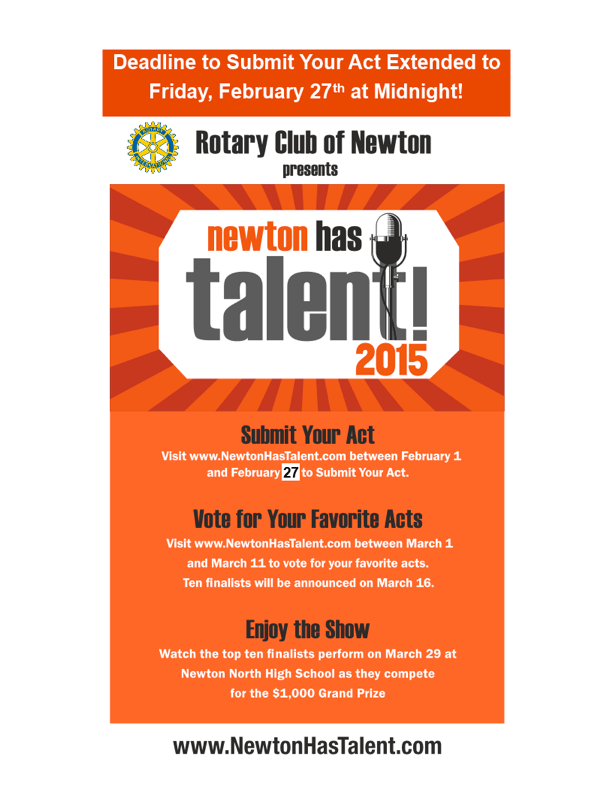 The Newton Rotary Club’s third annual Newton Has Talent is a city-wide contest, open to anyone who lives or goes to school in Newton and is at least 13–years-old by March 29, 2015. (If the act involves more than one person, at least one person must be a Newton resident or attend school in Newton) Enter by uploading a video of your act to the contest’s private Youtube site by 12 midnight Friday, Feb. 27. In addition to the video, you’ll be asked to submit a photo, biography and a $25 entry fee. Ten finalists, voted on by the public via the YouTube site, will perform at Newton North High School on Sunday, March 29, 2015 before celebrity judges and the public. The first place winner receives $1,000, second place — $500 and third place— $250. The top three winners will also perform at Newton Festival of the Arts on May 9 at Newton City Hall. Newton Has Talent’s premier sponsor is Village Bank. For more information, visit here. For more information about Newton Rotary Club, visit here. Category: Events · Tags: Newton Has Talent: Apply by Midnight Tonight!